From next year, you won’t be able to rent out your property unless it passes an efficiency test. Over one million dwellings in England and Wales would not currently pass the new rules, and could face huge fines. 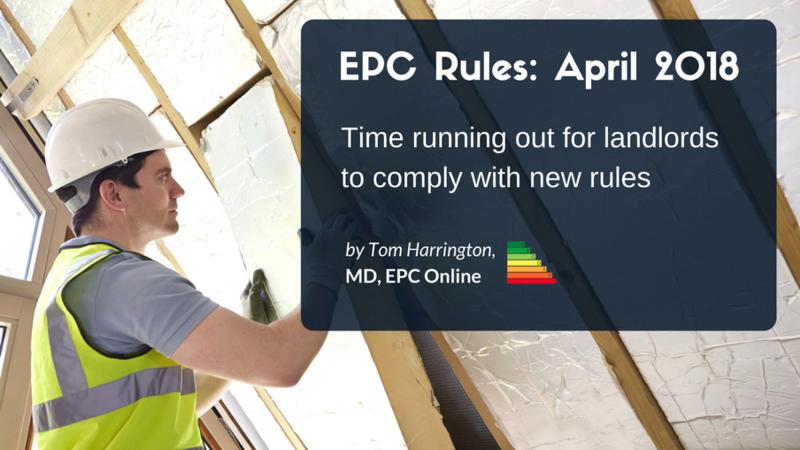 To make sure you don’t fall foul, EPC Expert Tom Harrington takes us through the new rules and what you need to do to make your property compliant in time. What Are the Upcoming EPC Changes? Landlords need to get a new EPC certificate every ten years. Back in 2015 legislation was passed that means, from April 2018, both domestic and non-domestic properties in England and Wales will have to meet a minimum energy efficiency standard (MEES). The minimum efficiency standard is set at an E rating for all types of domestic and non-domestic property. So which properties do the new EPC rules apply to? Without an EPC rated E or above it will not be possible to issue a new tenancy, or renew an existing tenancy, from 1st April 2018. There are fines of up to £5,000 for landlords that are found in breach of the legislation. Do the EPC Changes Affect Current Tenancies or Just New Lets? The 2018 rules only apply to new tenancies, but in 2020, the same rules will apply to all tenancies. After April 2018, if your minimum term ends, but you still have a contract in place, the rules won’t suddenly apply to your tenancy. Even if your last rating was below an E, you will be ok as long as you don’t renew your tenancy. After your minimum term expires, your tenancy can run on as a periodic tenancy. Read more about what happens at the end of your minimum term here. In April 2020, the new MEES rules will apply to all existing lets. At this point, you will need an EPC rating of an E or above to let your property at all. Even if your tenancy is already underway and you have no plans to renew, after April 2020, you will need to have an EPC rating of E or above or you could face fines. What Should I Do If My Rental Property Has an EPC that Is Lower than an E Rating? If your last EPC rating was below an E, the first thing to do is to get an up-to-date EPC carried out. You can order a comprehensive EPC report with OpenRent. EPC calculations are changing all the time and it is possible that you will receive a different rating to the one you got several years ago. If the property’s new EPC rating is still below an E, then you will need to make efficiency improvements to boost your rating before you let it out or renew your contract. Your EPC report will have a list of recommended measures for improving your property’s energy efficiency performance. You will need to carry out enough of these measures to improve your score to above an E rating. The recommendations in the table are cumulative. In other words, the rating in the ‘Rating After Improvement’ column shows you what the rating would be if you carried out that improvement and all the improvements above it in the table. Speak to your EPC assessor if you are unsure about how to proceed with improvements. After the energy efficiency changes have been made to the property, you will then need to get another EPC to show the new energy rating. In England and Wales, there are over one million domestic buildings with an EPC rating of F or G – that’s around 6% of properties. There are some exceptions as to which properties must comply with the new regulations. These will only apply in a small number of cases. If one of these apply, you can register for an exemption on the central register, which will be launched in October 2017. Devaluation: The required improvements will either cause damage or reduce the value of the property by 5% or more. Consent: It is not possible to gain the consent for the works to be completed required from the tenant, lender or superior landlord. Cost: The identified improvement measures are not cost-effective, either within a seven year payback, or under the Green Deal’s Golden Rule. How Do I Choose A New Boiler?